What you believe in as a leader and what your business believes in are the back bone of your company. Without you knowing your beliefs, how can you communicate them to your customers and staff? When we started the business 16 years ago, we believed that we could create a business that did retailing differently, where ‘customers always come first’ was not lip service; with every action we would make sure this became a reality. We believed that we could make a difference with how people live, and that we could make it easier to be healthy. We believed that we could create a high-performance culture where great people would thrive and average people would not. We believed that we could create a business that was dynamic and fun — and we refused to take ourselves too seriously. Your belief should be the guardian angel that you refer to with everything you do in every area — from product development to marketing to how you manage your staff every day. We do not always get it right, but knowing what your belief is gives you a reference point on how to act and what to do. An example when we got it wrong: We were having a meeting in the office and we ordered lunch from one of our nearby stores. When the store manager left to bring the lunch to us, it occurred to me that we were not living our beliefs. If we believed that customers always come first, then why was the most experienced person in that store leaving it? As a result, we were not providing the service that we promise to our customers. We were not more important than our customers — in fact, we would not exist without our staff and our customers. It is why often when a founder sells the business, the business can struggle. Because sometimes when a belief is not tangible, the process and bottom line becomes the most important thing. The reality is that if you get your belief communicated right, profits will come as a result of your business having a heart and soul. People can spend hundreds of thousands on consultants to come in and work out your vision, values and beliefs of the business. They are nearly always the same, and often you ask the staff and team a year later and no one can tell you what they are. We did our years ago and we still to this day it is simply: L.O.V.E L.I.F.E. We have absolute loyalty to the company and the people in it. It is our energy and love of life that makes our business different. 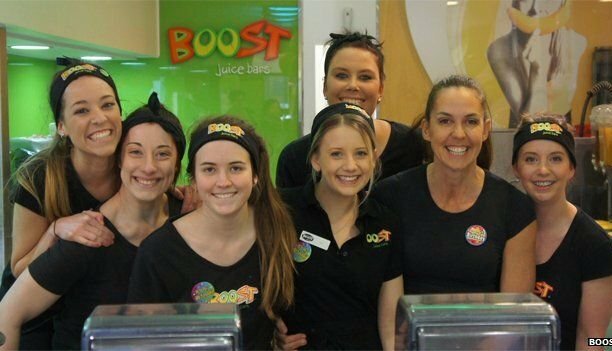 We all work towards the Vision & Values of Boost. With all our focus, the culture will always be strong. With the entrepreneurial spirit in our company, we will have the courage to innovate and continue to grow, and not be afraid to make mistakes. We are all responsible for our success or failure. To continue to innovate and keep ahead of the pack. We all are responsible for making sure we all have fun in the workplace and with our customers. Boost is a “WE” company, not an “I” company. We work together to achieve our goals without the layering. This is part of a Linkedin series, professionals share how their beliefs have shaped their careers, businesses and the workforce.